Oregon State Police had every right to shoot and kill Malheur National Wildlife Refuge occupant LaVoy Finicum during a Jan. 26 traffic stop in southeast Oregon, Malheur County District Attorney Dan Norris said today. The total of six bullets fired by state police troopers were "justified and, in fact, necessary," Norris said in a press conference today in Bend, Ore., where the Deschutes County Sheriff's Office released its investigation into the fatal encounter. Newly released audio and video also showed Finicum yelling "go ahead and shoot me." Harney County District Attorney Tim Colahan transferred the investigation to Norris in the interest of transparency and to avoid any perceived conflicts of interest. The sheriff's investigation and Norris' legal conclusion contrast sharply with the account of the Finicum family, which insists the Arizona rancher was unjustly murdered. Today's newly released video evidence also conflicts with the assertions of Victoria Sharp, who rode in Finicum's truck that day and claimed police riddled the vehicle with more than 100 bullets. Other than the six state police bullets, two additional shots were fired by FBI agents, and those will be investigated by the Justice Department's inspector general, Norris said. Neither of them struck Finicum, the FBI said. Finicum's death happened as state and federal police tried to arrest Ammon and Ryan Bundy and other leaders of the refuge occupation as they traveled to meet the Grant County sheriff on a remote highway north of Burns. 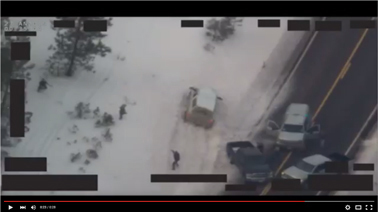 A video released Jan. 29 by the FBI shows the encounter when police shot LaVoy Finicum in Oregon. Click here to watch the video. The Deschutes County Sheriff's Office today released video captured by Shawna Cox, one of four passengers in Finicum's white pickup truck. It shows Finicum in a tense verbal exchange with police before speeding off at 70 mph, according to Deschutes Sheriff Shane Nelson. As Finicum turned a bend, he saw a police roadblock about three football fields ahead and had abundant time to slow down, Nelson said. Instead, he continued at a high rate of speed, at which point OSP troopers fired three bullets into his truck. "Mr. Finicum was using his truck as a dangerous weapon," which justifies the use of deadly police force, Norris said. After Finicum plowed into a snowbank, he exited the truck and OSP troopers commanded him to get on the ground to surrender. Finicum twice reached across his body to where police believed he had a gun, but OSP troopers held their fire. Finicum then grabbed his jacket with his left hand and reached a third time with his right hand, at which time OSP troopers shot him three times in the neck, shoulder and back. "They believed he was reaching for a handgun and was about to use deadly force against them," Nelson said. Finicum did have a 9 mm loaded handgun in his jacket pocket, police said. Correction: An earlier version of this story misattributed a quote by Nelson as coming from Norris.